Take a look at this photo. What’s going on? It’s Dance Marathon at UF! Dance Marathon at the University of Florida is a year-round fundraising organization that culminates in a 26.2-hour event at the Stephen C. O’Connell Center, where UF students stay awake and on their feet to show their support and raise money for Shands Hospital for Children at UF, a Children’s Miracle Network (CMN) hospital. 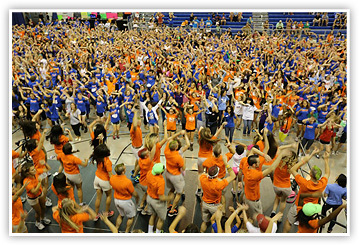 The 26.2-hour Dance Marathon at UF took place over the weekend of March 31st - April 1st. In the end, as shown to the students during the closing ceremony after every penny was counted (see photo below), the students raised $886,726.15, net of expenses, for the kids. Amazing! These dollars will be put to immediate use to provide care for the kids at the Shands Hospital for Children at UF, for purchasing needed equipment such as neonatal incubators, transport monitors, ultrasound and laparoscopic equipment, an d sleep chairs and sofas, and for faculty research that is directed at improved prevention, diagnosis and treatment of pediatric diseases. 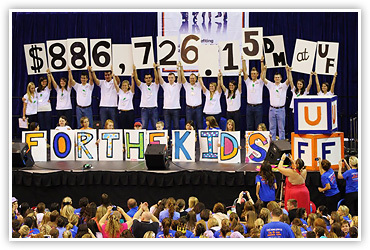 Dance Marathon at UF is the third largest CMN Dance Marathon program in the country and the most successful student-run philanthropy in the Southeast. About 1,780 UF students directly planned and participated in the event (815 dancers, 15 chairs, 232 captains and 721 staffers), with an additional 3,000 students engaged in fundraising throughout the year. There has been tremendous growth in Dance Marathon at UF. The first year, 1995, involved 79 dancers and raised $12,425. This figure increased to $158,604 in 2000 and $319,843 in 2005. Even compared with the exceptional fundraising of $520,872 in 2010, this year’s total of $886,726 is totally awesome. This phenomenal success is a testimony to the momentum provided by the preceding dance marathons and especially to all of the students involved in this year’s Dance Marathon at UF. Who are these students? I can’t name all of them here, but let me list the 15 Overall Team Chairs, each of whom showed superb leadership in their area of responsibility. Shown from left to right in the “reveal” photo above, they are: Samantha Capone (Finance), Meredith Chipman (External Communications), Alexandra Spratt (Overall Chair), Patrick Spook (Internal Communications), Jorge Sanchez (Operations), Christina Stine (Entertainment), Octavio Casanova (Recruitment), Steve Giordano (Technology), Steve McLaughlin (Morale), Madison Hager (Hospitality), Mackenzie Pape (Family Relations), Garrett Chappell (Marketing), Blake Oliver (Community Events), Eden Joyner (Public Relations) and Natalie Hyman (Dancer Relations). These students serving on the Overall Team, along with several other student volunteers known as Captains, have spent countless hours planning — not only the big Dance Marathon event, but also additional events through the year that build up to Dance Marathon weekend. These students gave up many weekends to attend high school mini-dance marathons, and gave up many evenings to attend weekly meetings and participate in many events to fundraise and spread awareness about Children’s Miracle Network at Shands Hospital for Children at UF. Notably, Dance Marathon creates a special way to celebrate a milestone that each Miracle Kid achieves because of the care they received at Shands. One Milestone example is that of Tyler Kleine, a 10-year-old who was treated by Shands and dreams of one day becoming a Navy SEAL. Dance Marathon surprised Tyler by partnering with the UF Naval ROTC and giving him a day in the life of a Navy SEAL. Dance Marathon also involves their 39 Miracle Kids in a pen-pal program, pairing each child with an organization on campus. Many organizations had their pen pal over for dinner or play days throughout the year. The Family Relations team oversaw all of these projects, in addition to holding Friday Pediatric Movie Nights inside the hospital offering our pediatric inpatients a chance to eat pizza and watch a movie with the Dance Marathon students. …and then, of course, there is the Line Dance (first photo above). On the hour, every hour, for 26 hours. Excerpts from 38 songs woven together into a seven-minute, 10-second line dance in which every beat is choreographed. The Morale Team Captains (about 40!) who chose the music and choreographed the moves must be recognized here for their genius, as the line dance creates the energy that drives the entire event. A special shout-out to Steve McLaughlin (“Butters”), for his patience and indulgence in teaching me the line dance. It was a blast dancing with the students, and I still can’t get the music out of my head. This year, of special significance was the Pence family of Gainesville. The Pence’s only son, Tyler, was treated at Shands and has been involved with Dance Marathon for four years. On our behalf, the Pence family entered The Primrose Schools Family Dance-Off Competition, a video competition in which the video with the highest number of votes won a donation to a Children’s Miracle Network Hospital of their choice. Their video, “The Pence Bunch” depicts their family of seven dancing to “The Brady Bunch” theme song. Dance Marathon at UF partnered with the family to push voting to the campus and community. Thanks to tireless efforts, the video came in second place nationally, winning $20,000 for Shands Hospital for Children at UF. The family also received a check for $3,000 from Primrose Schools for winning second place and generously donated it back to Shands, making the total $23,000. Tyler was also featured in a Milestones Campaign video, during which he met UF Football Coach Will Muschamp and was able to watch a Florida Gators football practice. No surprise, Tyler dreams of being a Florida Gator someday and hopes to dance at Dance Marathon! 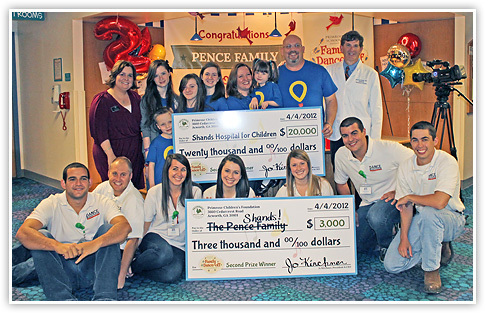 The photo below shows the Pence family with Dr. Scott Rivkees, chair of the Department of Pediatrics, and members of the Overall Team Chairs. Of special note, there are two other Dance Marathons that benefit the Shands Hospital for Children at UF: FSU and UCF. The Dance Marathon at FSU took place February 18-19 and raised $584,024 dollars, half of which is for the Shands Hospital for Children at UF and half for the FSU College of Medicine. At Dance Marathon at UCF, known as “Knight-thon,” the students raised $118,972.27, half for the Shands Hospital for Children at UF and half for the Arnold Palmer Hospital for Children. “The most powerful thing from Dance Marathon is seeing the change. It is not only the change that we see in the kids as they are able to get out of the hospital, but the change that happens in the students and happens over the years. Dancers leave the event changed, and with a purpose. They come back year after year to serve the cause, and stay involved as alumni. As for the children that Dance Marathon helps, I was honored to serve as the Family Relations Overall Chair this year with five captains who themselves were Miracle Children when they were younger. That is the change that Dance Marathon can do, and why I am honored to be able to say I've been a part of this organization.” Mackenzie Pape To learn more about our Dance Marathons, visit floridadm.org, Knight-thon.com, or dm.fsu.edu. And please join us at the next Dance Marathon at UF on the weekend of March 23rd, 2013.